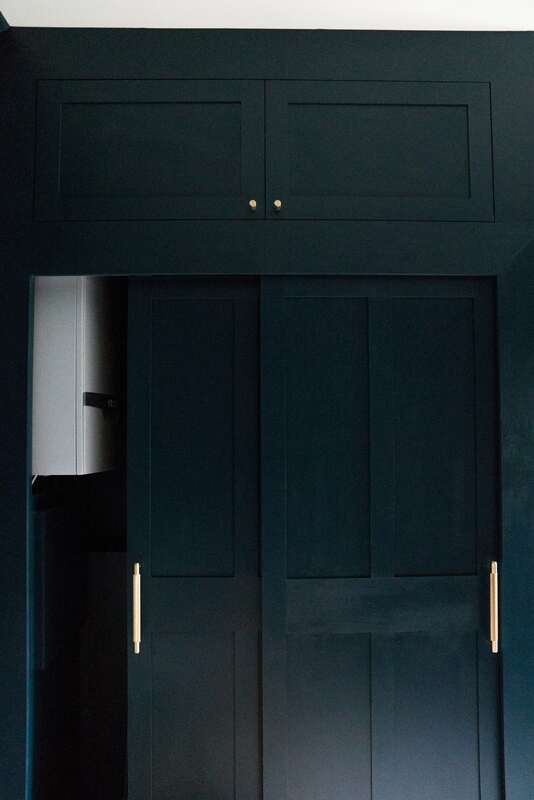 Walls and cupboard: Farrow & Ball ‘Hague Blue’. Chair: £195, Ikea. Floor lamp: £65, Next Home. Pull bar: £61, Buster & Punch. Ceiling light: £189, Heal’s. Rug: French Connection (this size sold out but the square one available here). Photographs: Christopher O’Donnell. There is so much I want to talk about in this blogpost! 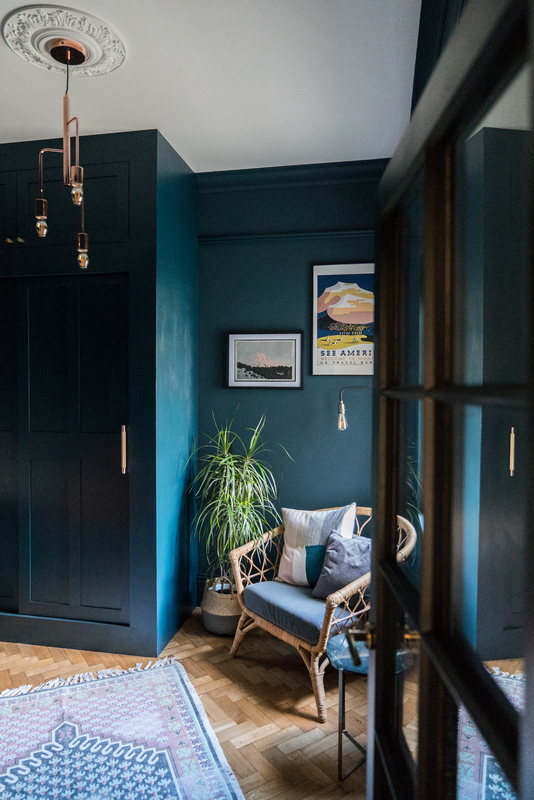 This room has been over 10 months in the making – and has been a real labour of love, and so much more expensive than we ever imagined…but once we were ‘in’ it, we decided we wanted to do it properly – one of the reasons it took so long! 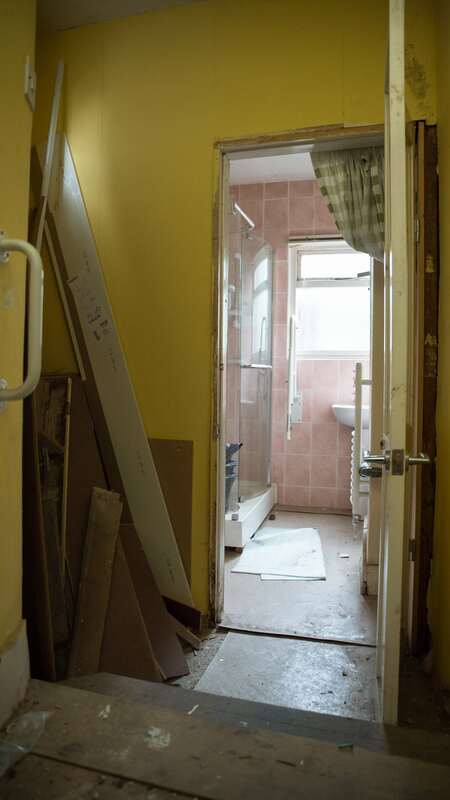 After our bathroom, this was the next stage of the renovation…in terms of priorities, a study wasn’t actually up there – however, the room that was originally here was in such dire need of attention that we had to tackle it next. 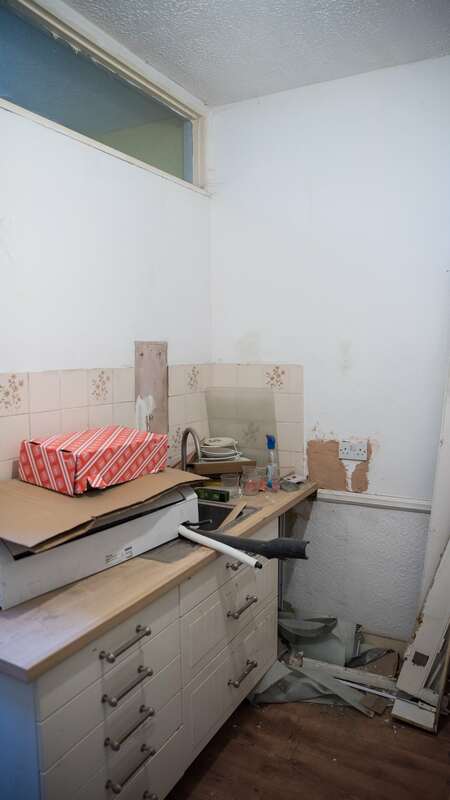 It was a room we called the dungeon – it was the old kitchen (even though were no appliances in the room – just cupboards full of the previous tenant’s crockery!) and then attached to it was a dodgy lean-to bathroom extension which was leaking, was partially outside and frankly: scary. 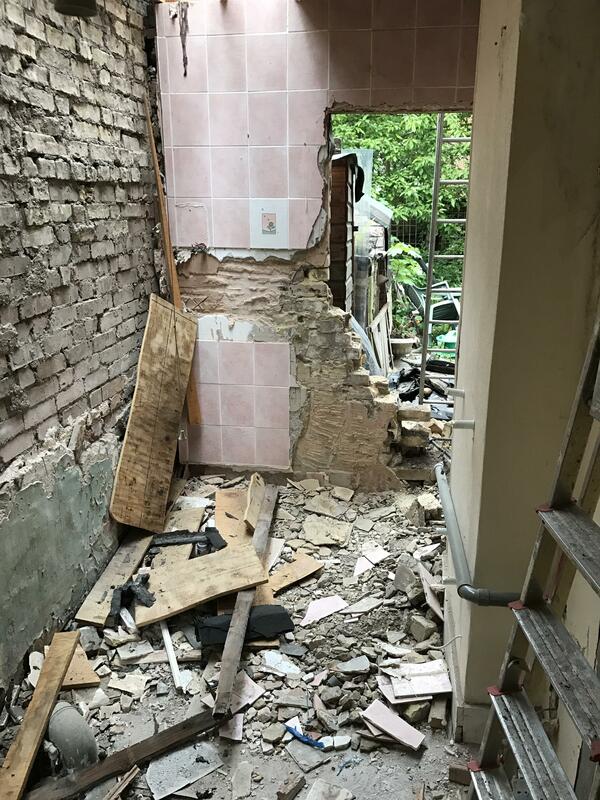 The ceiling also caved in after a month of living here – thankfully I was in the room next door when it happened! 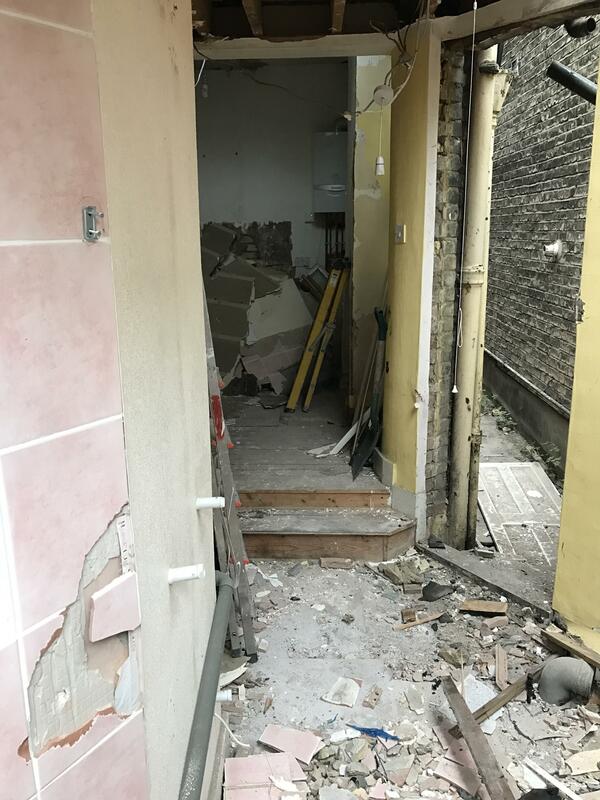 Unlike most people in London, we chose to get rid of the extension rather than keep the extra space – this meant we could get side access back to the house, solve all the leaks and issues with the lean-to and have a bit more outside space. 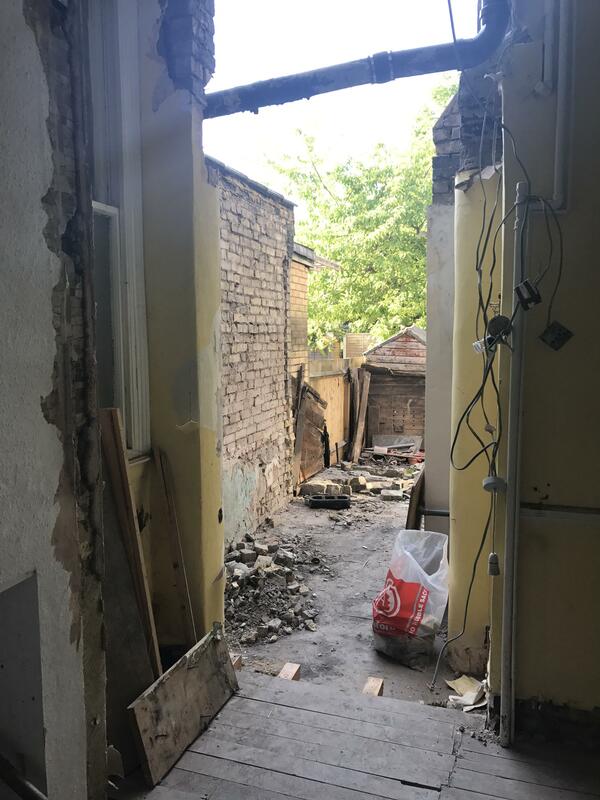 We also got rid of the chimney breast to give us more room (and we took it out of the room upstairs at the same time) and removed the window looking out to a dark alleyway and put it in the back of the room instead, looking out to the garden. 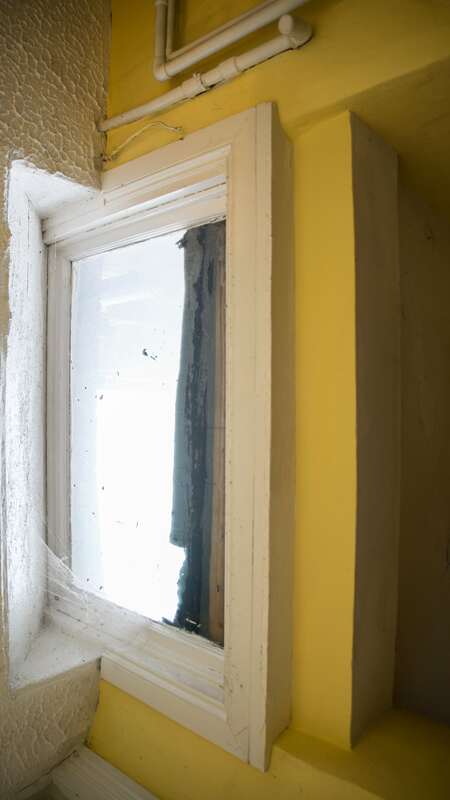 The work started in April last year and took 2 months of structural work and then they left it all plastered. And then we ran out of money. 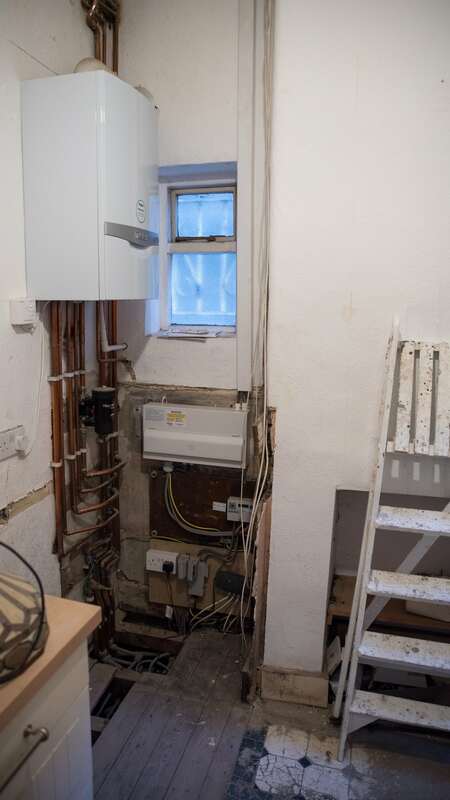 It took us a while to find a window that was right (and came with warranty after installation – a lot of brands supply aluminium windows but don’t fit them) and then we still had to figure out how to hide the boiler and we had a tough time finding a door. 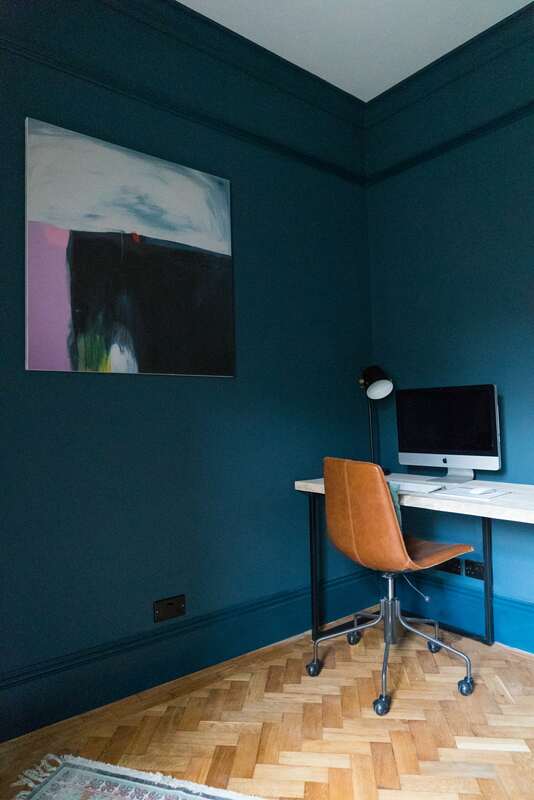 So we painted it Hague Blue (which I’ve talked about more in this blogpost) and got the flooring done – by Mick the amazing floor guy. 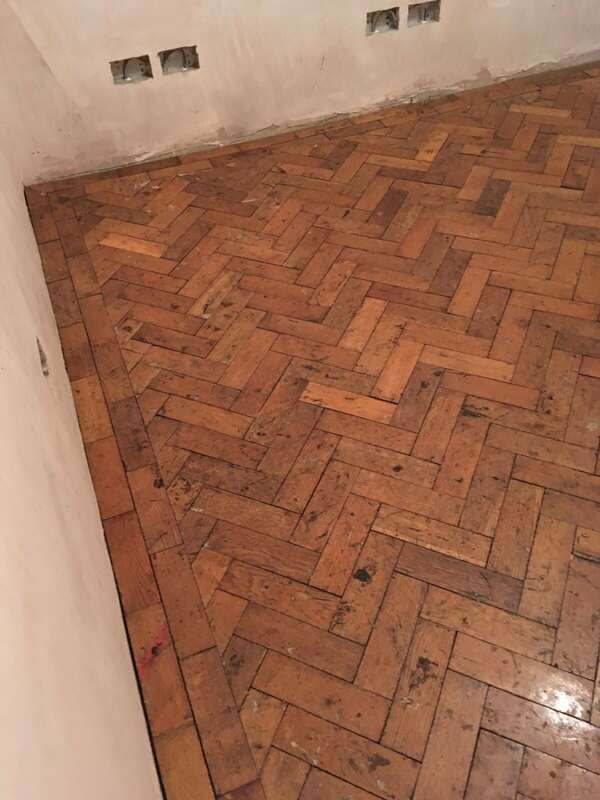 This took another few months…we knew we wanted parquet and I was suggested reclaimed flooring by another friend who was renovating. It hadn’t crossed my mind to get it secondhand but there are loads of companies who specialise in it – they salvage it from old schools and gyms. It comes all grubby and covered in glue but once the fitter has worked his magic it looks fantastic. 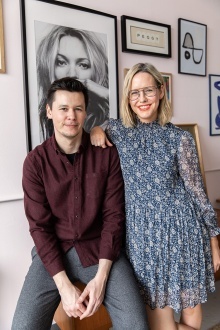 Again, it wasn’t a cheap job but we are so happy with it and we are treating this house as our forever home with no compromise (would rather it just took longer to do!). 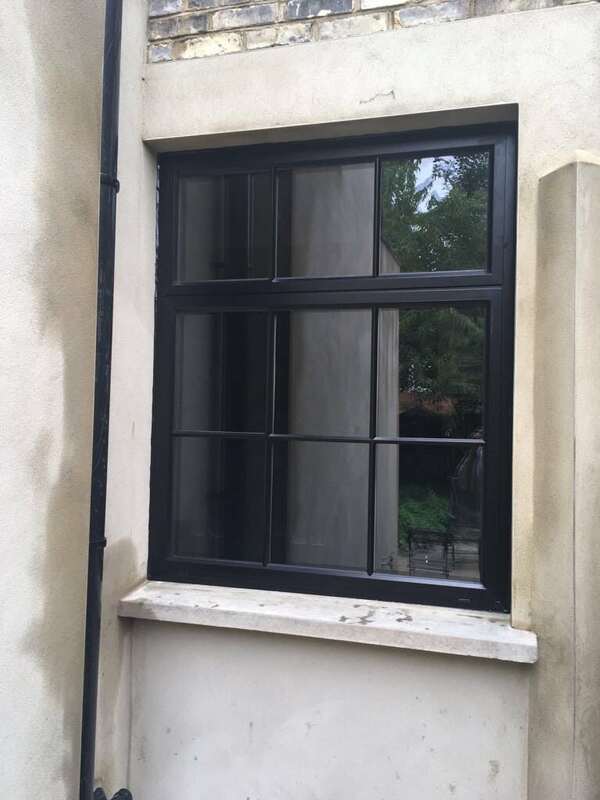 The finished window from outside – the walls are all rendered and we need to paint the courtyard area. Maybe a springtime job! Oversized shirt: £19.99, H&M. Coated leggings: £28, Next Maternity. Loafers: Isabel Marant (old but buy similar here). Chair: West Elm (sold out but a fabric version available here). Everything in this room became quite tricky to be honest, and we didn’t want to rush it. 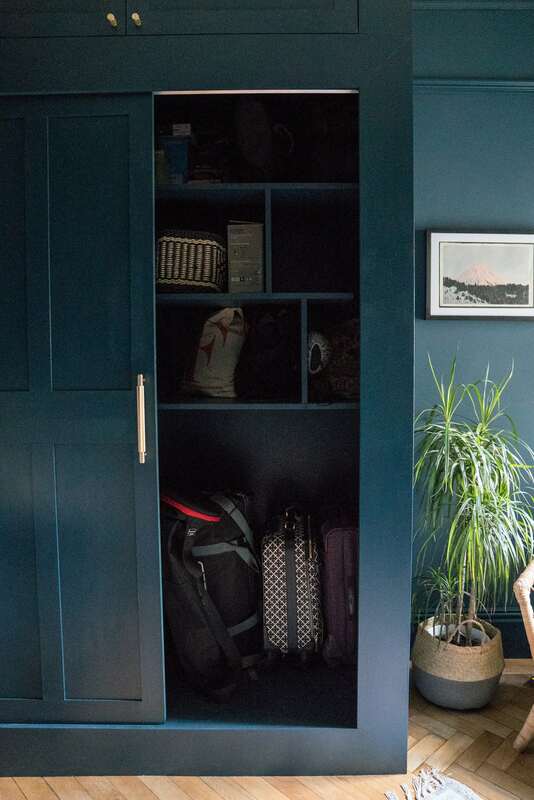 We knew we wanted built in cupboards to hide the boiler but also to store all of our kitbags, tripods, equipment for work, chargers etc. 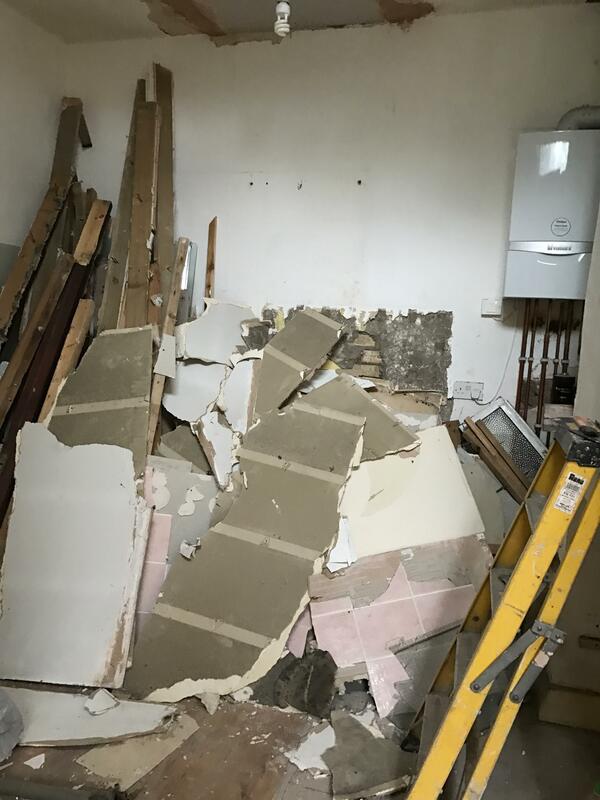 We had knocked down the under stairs cupboard in the hall so storage in the house was becoming scarce – but quotes from carpenters were around £5k minimum (we wanted panels, the boiler boxed off, sliding doors etc) so we just decided to wait. And when the builders came back for the next job in November, we asked if they could do something instead. It cost roughly £1500, exactly how we wanted and to our specifications. 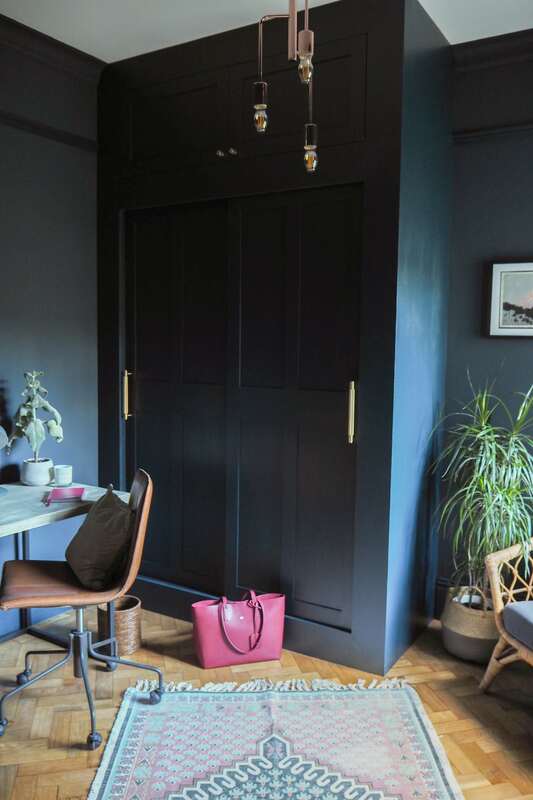 To make the MDF cabinet look less bog standard, I knew it needed some decent handles and I have to admit, these Buster & Punch ones make all the difference – it really brings it to life (I saw them originally in Emily from The Pink House’s home – you can see the tour on my blog here). Knobs: £32 for two, Buster & Punch. Pull bars: £61 each, Buster & Punch. Trestle table legs: £60 each, Habitat. Wooden desk: Etsy. Lamp: Trouva (available in black here). Wastepaper basket: £32, Kalinko. Leather tote: £80, The Aurora Store (available in black here). 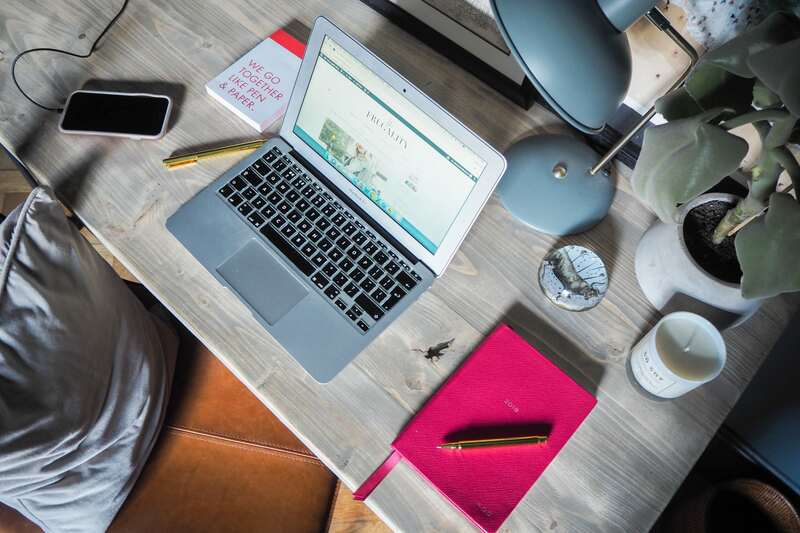 Again, we knew we wanted a long desk against one wall – so we found someone that had tables we liked the look of on Etsy and contacted them to make a table top to order and just put it on trestle legs – much cheaper way of doing a made to measure desk. 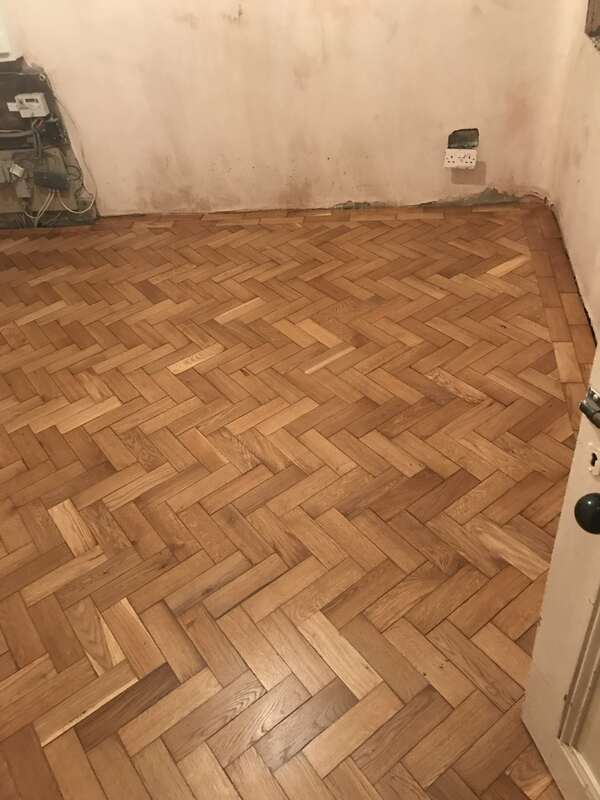 I would mention that we weren’t 100% happy with the result at first, and Chris had to re-sand this as it came in an unexpected colour – like it had been stained a green/grey. but we love it now! 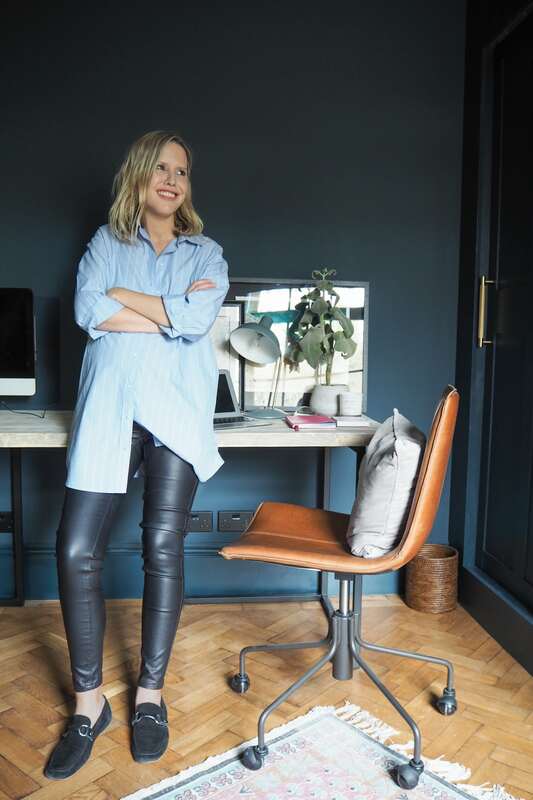 Diary: Smythson. Candle: So Soy. Concrete plant pot: Monpote. Window: AM Glazing. Blinds: Blinds 2 Go. Ceiling rose: WM Boyle. 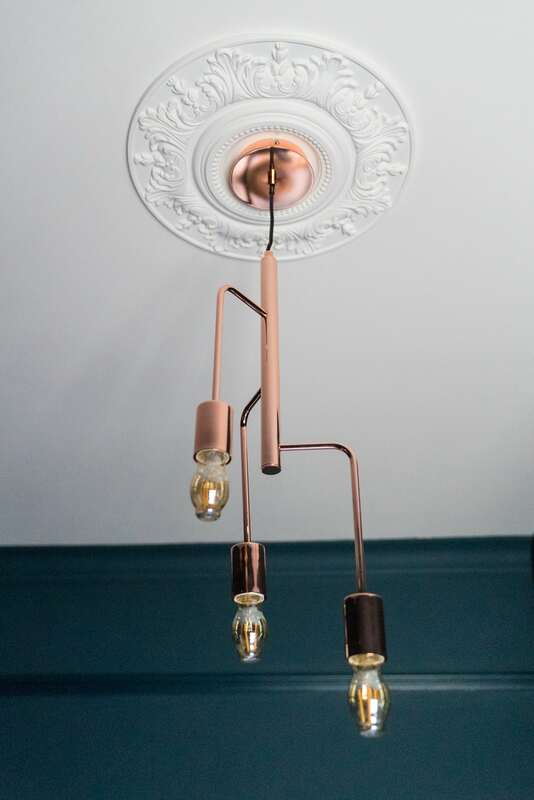 Ceiling light: £189, Heal’s. Handles: Saxon Security Locks. Light switch: £6.99, Amazon. Plug socket: £15.87, Amazon. Yes, we’re still looking for a small cabinet to go under this print…but I wanted to talk about the door. 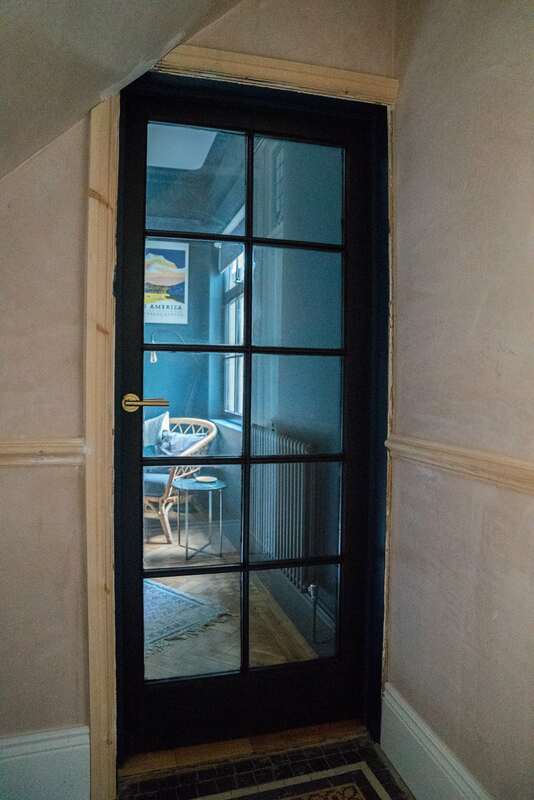 Again, we wanted something with glass to let more light into the hallway (our hall is in the centre of the house so not much natural light) and originally wanted an aluminium one to match the window – but size wise it was tricky as this space was very narrow, so we ended up getting it made by a local joiner – it was cheaper than an aluminium one and meant we didn’t need the big threshold that comes with those doors but sadly we can’t really recommend him as he got the measurements wrong about three times….we painted it ourselves to save money and my parents’ locksmith shop helped me with the handles – they don’t sell online but you can call and do mail order. 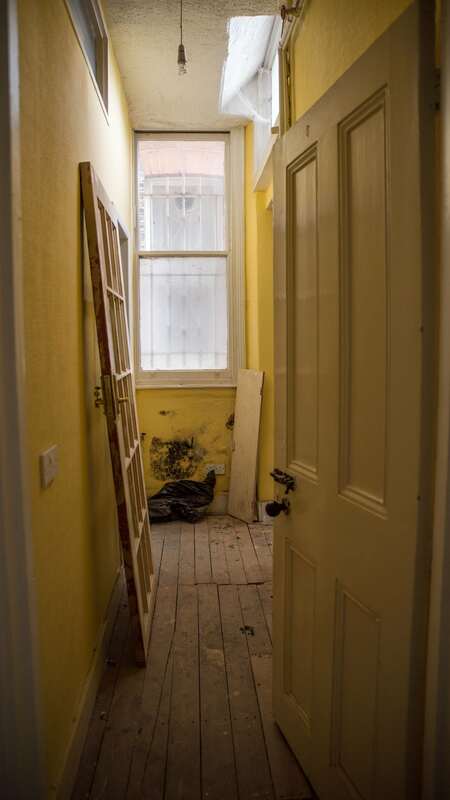 By the time we researched and got the door finished, the builders had come back to do the hall and build the cupboard, so this room was filled with so much dust and plaster…we actually had to repaint it again, which was a little soul destroying but worth it in the long run. Prints bought from around the world on our travels (the Mount Fuji one we bought from an old shop in Kyoto, on our honeymoon). Print: Lola Donoghue via Etsy. We moved this from our living room to add some colour to the walls. So I think that’s mainly it…we’re still after a shelf to go above the desk, we want to add a few more pictures and get a book shelf/cabinet for the space by the door but we love this room – it stays warm despite being external walls (that’ll be the Acova radiator) and we are so productive once we get in there to work. I am so happy to have a boiler hidden away along with the ironing board, a lot of our junk and spare suitcases. 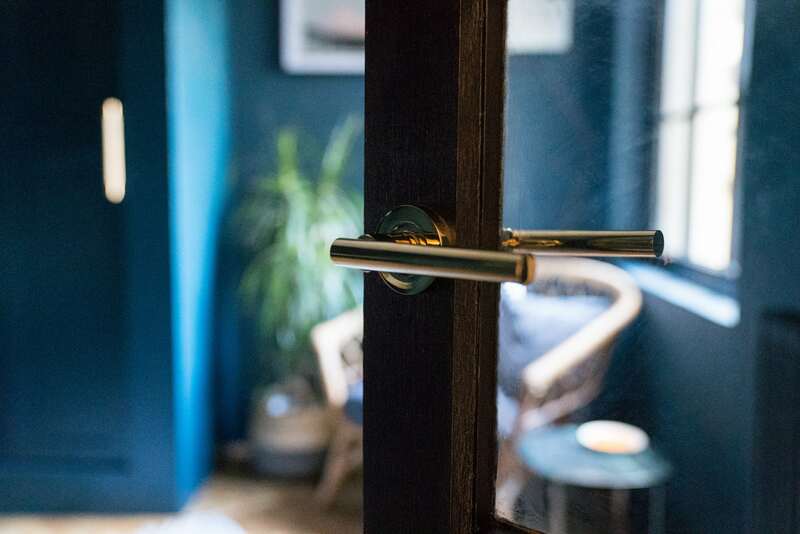 And we are most of all, happy that we went bold here – a dark room is a risk (and we almost always need the light on) but it makes us happy when I walk through the hallway and glance through the glass doors – and that’s what matters. I still can’t believe we live here sometimes. Chair: £195, Ikea. Floor lamp: £65, Next Home. Rug: French Connection (this size sold out but the square one available here). 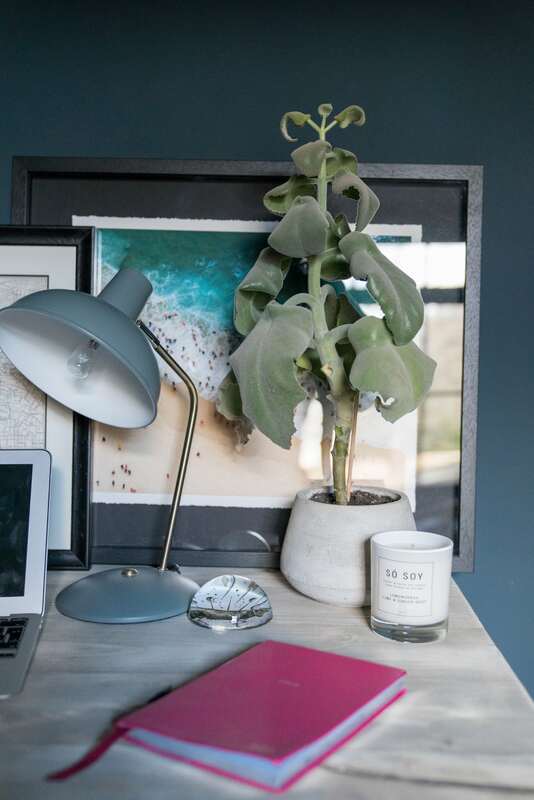 Plant: Ikea. Grey velvet cushion: H&M Home (buy similar here). Block colour cushion: West Elm (old). Hope you found it useful and not too waffly, there was A LOT of info I wanted to get across! Wow, it’s really lovely. 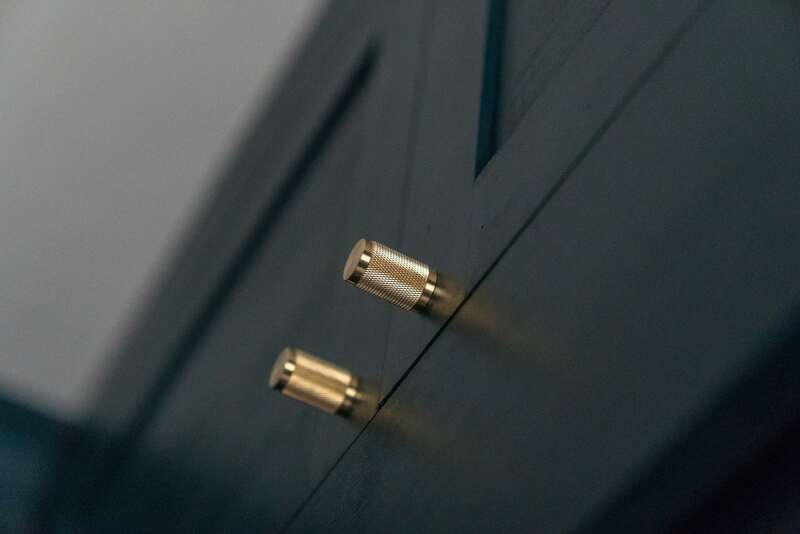 I bought some knobs from Buster and Punch for our living room cupboards and I love them, well worth the money. I love your house updates! Totally agree – I’m now finding every other handle in our house ‘unbearable’ and trying to change them all for B&P! Husband not so keen….!! This looks amazing! 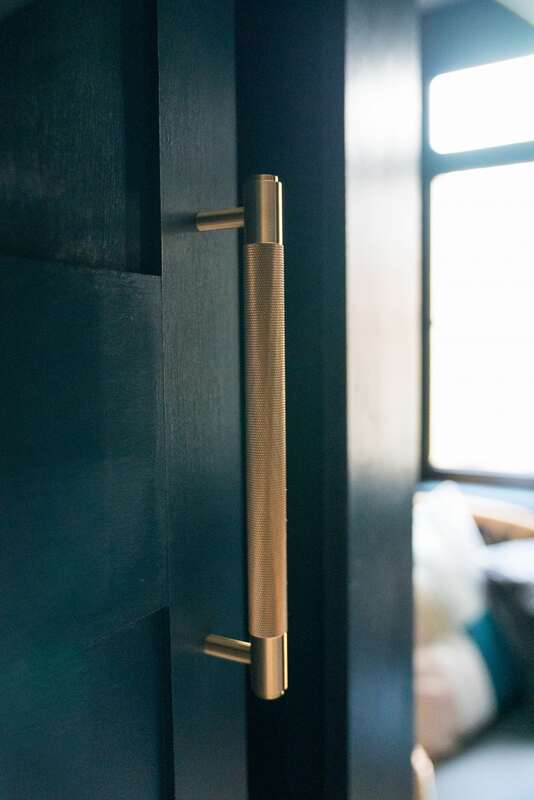 It can feel forever when you are doing something yourself, but the finished product was well worth the wait, and those handles make your cupboard look so swish. 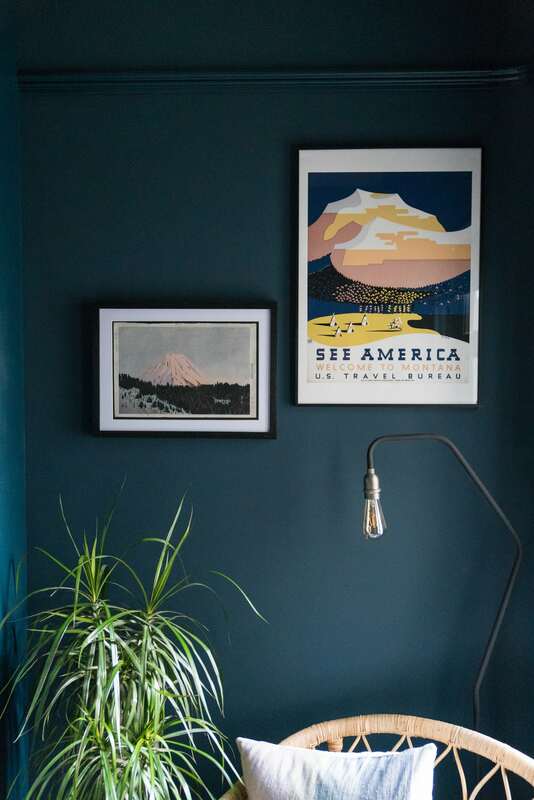 I’ve just bough a tester of Hauge Blue for our bedroom – looking forward to splashing it on the walls! Absolutely beautiful. I enjoy your renovation posts a lot! Love the shade of those walls! ? Looking fab! I love those prints so much, I’ve been trying to collect pieces for frames every time we go away, I did see some beautiful retro style maps in Daunt Books the other day but I think I’ll try and find something more authentic when I’m away this year! This room is pure perfection Alex. 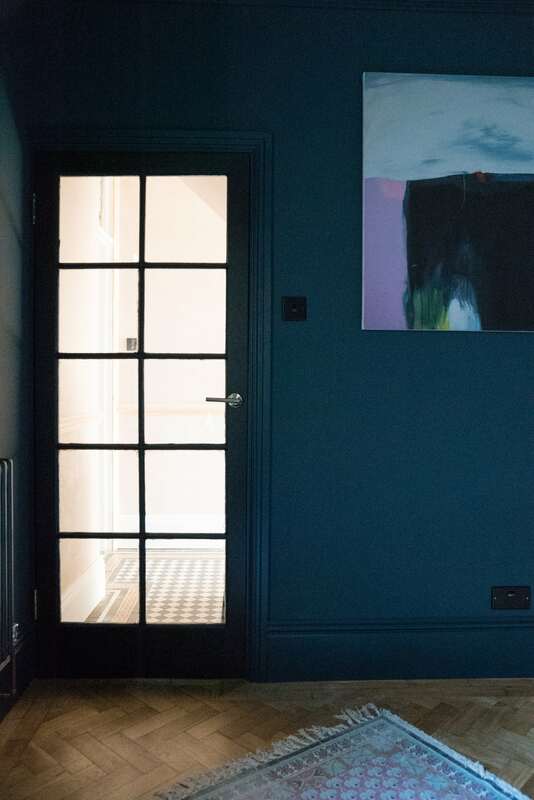 The touches are all the things I adore, the floor, wall colour, panelling, window style. It looks beautiful. It’s a taste I’ve acquired over the years. See also: lots of copying on Pinterest !! No waffle, all fantastic insights and testament to your determination and great taste! Room looks fantastic! Wow Alex, it looks stunning, great work! May I ask you a tip? where did you get the door from? No, I haven’t started properly looking as we are still waiting to remortgage to start with the renovation early next year. We live in N22 too, reason I asked you for the contact, it would be local for us. Great room, great video. 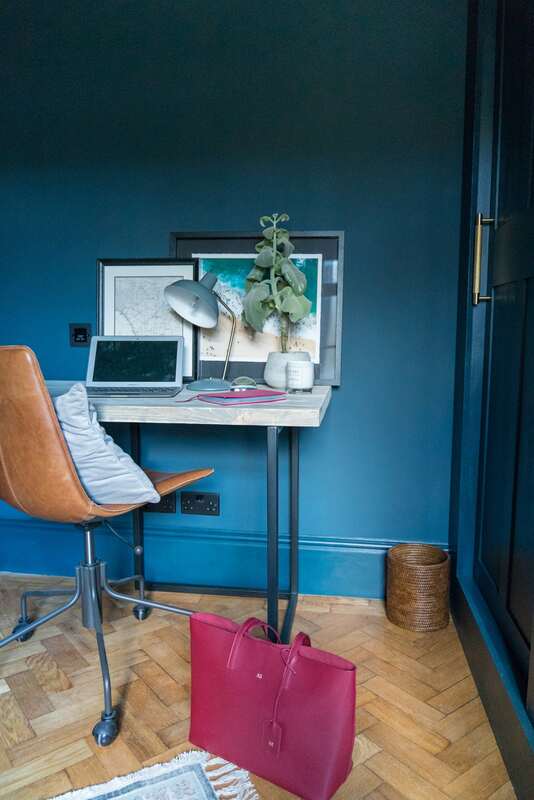 Love the bold colours too, the chairs are A lovely contrast to the walls. 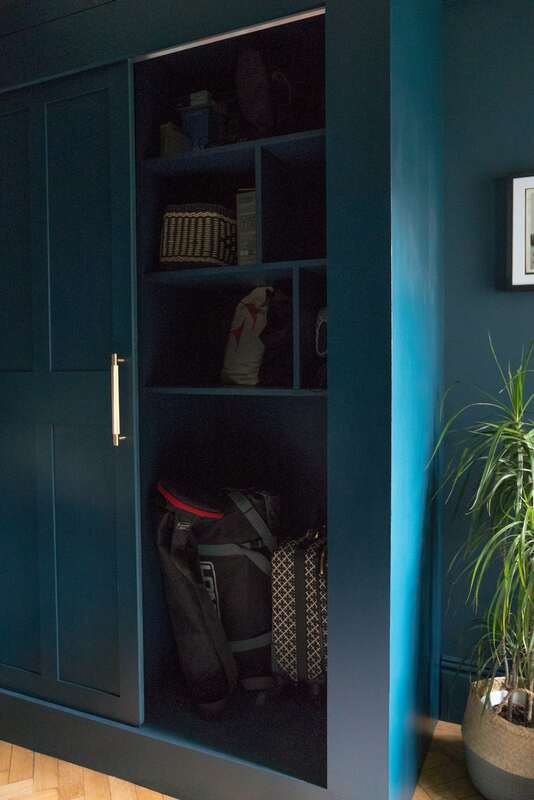 A floor to ceiling cupboard helps stop the room looking cluttered, stops you putting things on the top of it too! The video gives a good impression of the size of the room, it looks bigger than I’d expected. Any chance of a floor layout plan? Helps me put thing into context spatially! Wow this is such a stunning room. 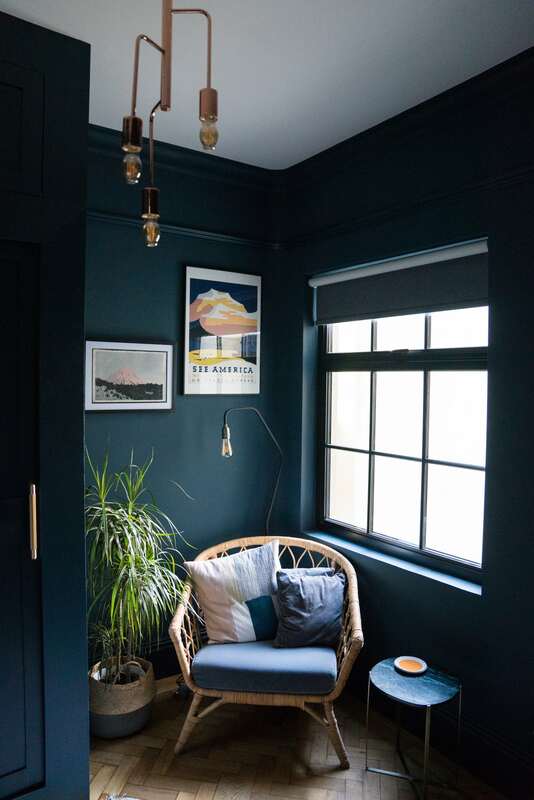 I’d never have considered a wall colour like that but it looks amazing!